The urban underground is a spider web of utility infrastructure where telecommunication, electricity, gas, water and cable TV grids compete for space with drainage, mass transit and rail networks and road tunnels. 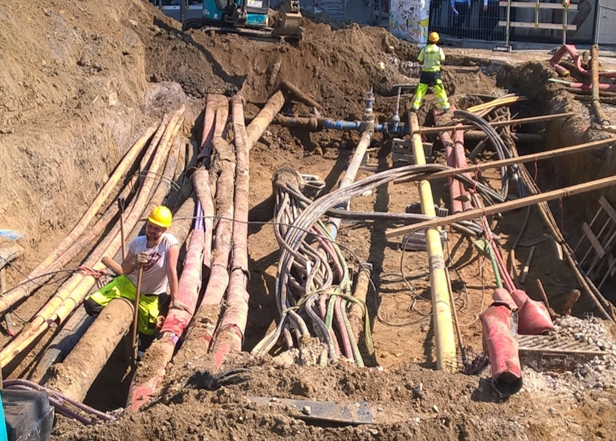 Ongoing deregulation of utility services puts a further strain on underground space requirements as multiple new providers seek to deploy parallel networks. As the number of underground networks grows, so does the risk of accidental damage to existing infrastructures. Add to this complexity the increasing demand for Quality of Service, often invoked by tightening Government regulations, and it is clear that the need for accurate mapping of one’s network becomes critical for operational, maintenance and insurance purposes. Most non-gyroscopic mapping systems require topside personnel to follow along the path of the pipeline, using a beacon or ground-penetrating radar to map the utilities. However, none of these systems get the exact measurement of the pipe’s centerline. Moreover, beacon-based systems can measure to a limited depth and are highly susceptible to electromagnetic interference, rendering these systems virtually useless in densely piped areas or near railways and power lines. The DuctRunner™ technology is a gyroscope-based system that has been developed for off-line positional recording. The key application for DuctRunner™ technology based tool is to record the centerline position of onshore or offshore pipelines. Because the DuctRunner™ technology is not dependent on GPS technology while logging, it is particularly useful for underground applications.